March 26th is National Spinach Day, and you know what that means: Eat some spinach to celebrate! The colorful, nutritious recipe (photo #1) makes a nice lunch or dinner. Fresh spinach, orange segments, peppers and red onion make a colorful base for salmon or other fish fillets. 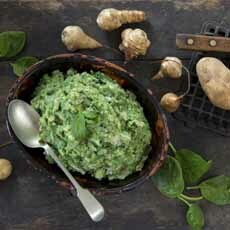 And there are many more recipes below, including spinach mashed potatoes: a great idea (photo #4). The recipe, sent to us by the California Avocado Commission, is from Salmon: A Cookbook, by Diane Morgan (photo #3). Prep time is 10 minutes, cook time is 10 minutes. *Brush the exposed avocado with olive oil or cover tightly with plastic wrap to prevent oxidation (browning). As with all fruits and vegetables, wash the avocado before cutting. 1. COMBINE the olive oil, vinegar, mustard and sugar in a small jar with a tight-fitting lid, with salt and pepper to taste. Cover tightly and shake vigorously to blend. Taste and adjust the seasonings; set aside. 2. PLACE the spinach, onion and bell pepper in a large salad bowl. Put the orange segments in a separate, small bowl. 3. SEASON the salmon on both sides with a bit of salt and pepper. Place a large, heavy skillet over medium-high heat. When the skillet is hot, add the remaining olive oil and swirl to coat the pan. Add the salmon, skin-side down, and cook until the skin is crisp, about 4 minutes. 4. CAREFULLY TURN the salmon and cook until the fillets are almost opaque throughout, but still very moist—or an instant-read thermometer inserted in the center registers 125°F to 130°F—about 4 minutes. Transfer to a warm plate and set aside while you toss the salad. 5. TO SERVE: Add the orange segments to the salad bowl, give the dressing a last-minute shake, and pour it over the salad. Toss gently. Arrange the salad on 4 dinner plates. Place a salmon fillet in the center, on top of the salad; garnish each salad with 4 slices of avocado; and serve immediately. 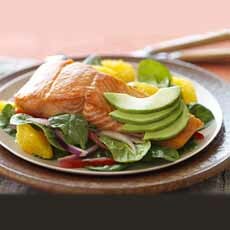 Top a spinach salad with a salmon fillet (photo courtesy California Avocado Commission). Pick up some perky, fresh spinach (photo courtesy Ocean Mist | Chronicle Books). 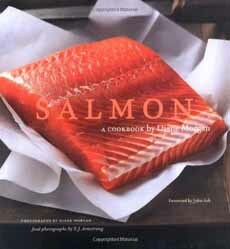 Thanks to Salmon: A Cookbook for this recipe (photo courtesy Chronicle Books). Recipe #2: mashed potatoes and spinach (photo courtesy Idaho Potato Commission). What a great idea! Sun chokes add another dimension to the recipe, but if you can’t find them or don’t want them, leave them out. In fact, here’s a very easy preparation for spinach mashed potatoes: Simply make mashed potatoes. Cook frozen spinach and press out the water. Blend with the mashed potatoes. Add butter or cream, garlic, salt and pepper to taste. Roasting a head of garlic (photo #5) and mashing it into the potatoes and spinach is a delicious idea. 1. COOK the potatoes: Place the potatoes in cold water and heat the water to just below boiling. The water will be steaming but not moving. Cook the potatoes in the steaming water until fork tender, about 1½ hours. 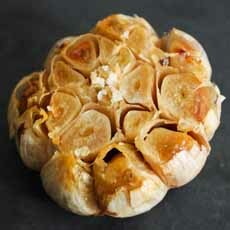 Roast garlic bulb (photo courtesy Domesticate Me). 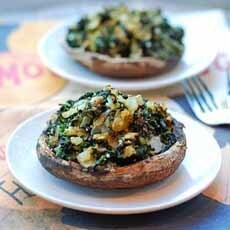 Portabellas stuffed with spinach (here’s the recipe from Healthy Recipes Blog). Baked spinach chips (here’s the recipe from Hungry Couple). 3. ROAST the sunchokes and garlic until soft, 35 to 45 minutes. Remove them from the oven and turn down the oven temperature to 325°F. Squeeze the cloves from the garlic and set aside. Remove the cooked sunchokes from oven and puree with 1/2 cup cream, using an immersion blender or food processor. 5. HEAT a second pot of water to boiling, to blanch the spinach. While waiting for the water to boil, melt the butter in a small saucepan, and blend in the remaining cup of cream until hot. Set aside. 6. PREPARE the ice bath (ice cubes in a bowl of water). 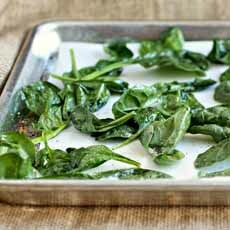 Prepare the spinach in boiling water for two minutes. Remove it with a strainer and plunge into the ice water. Squeeze out the water and purée the spinach with a food processor or immersion blender. Set aside. 7. REMOVE the potatoes from oven. Leave the skins on. In a large pot, smash the potatoes with a potato masher, adding small amounts of the hot cream/butter mixture as you go, until potatoes are fluffy. Squeeze in the garlic cloves and sunchoke purée and continue to smash. Fold in the puréed spinach. Adjust seasoning, adding salt and pepper to taste. 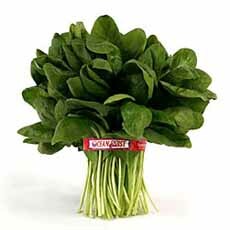 Spinach (Spinacia oleracea), is native to central and western Asia (think ancient Persia). It is a member of the botanical family Amaranthaceae, which also includes amaranth, beet, chard, lamb’s quarters (mache) and quinoa, plus numerous flowering house and garden plants. It became a popular vegetable in the Arab Mediterranean, and in 827 was brought to Italy by the Saracens. It arrived in Spain by the latter part of the 12th century, and in Germany by the 13th century. Spinach first appeared in England and France in the 14th century and quickly became popular because it could be harvested in early spring, when other vegetables were scarce. Spinach was supposedly the favorite vegetable of Catherine de’ Medici (1519-1589), wife of King Henry II of France. Dishes served on a bed of spinach are known as “Florentine” after her birthplace, Florence. “Florentine” dishes are sometimes served with Mornay sauce, a béchamel sauce with cheese (usually Gruyère or Parmesan).